Last40 deserves a close look. 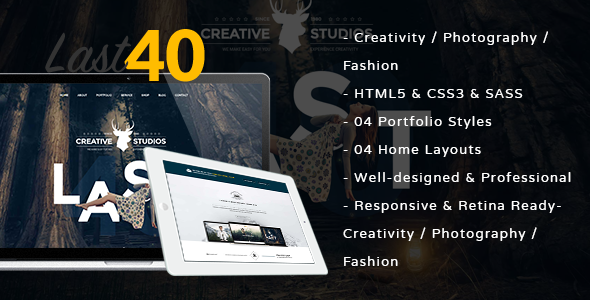 Last40 is a professional HTML5 Template designed for Creative Studios, Photography, Designing or Fashion websites. Its minimalist and impressive design with plenty of useful and beautiful page layouts is what will blow your mind. There are 04 Portfolio designs for you to choose how to showcase your works and projects, 4 Home styles to effectively display major contents and purposes of your site, 02 Shop layouts ready for building an online shop, 02 Blog pages to creatively list interesting news and posts in the field. Besides, Last 40 has contact form with Google Maps, parallax background, mega-menu and amazing animations. Without doubt, it owns many other features that will help to build an accessible and user – friendly website. It is SEO- ready, cross-browser compatible, and mobile-friendly. Last40 – beauty lies in every detail. Click Live Preview to enjoy more!